Apple's issues with the LG Ultrafine 5K Display may reach further than problems associated with nearby Wi-Fi routers, as users are now reporting worrying hardware troubles unrelated to networking hardware. After Monday's report of Wi-Fi routers causing problems with some UltraFine 5K Thunderbolt 3 monitors, an ongoing thread on the Apple community support forums refuted that it was the sole cause of the problem, with users still seeing sporadic connectivity. Regardless of the root cause, the problem does not appear to affect all configurations. During the course of AppleInsider's UltraFine 5K review, for example, the evaluation unit was within three feet of two different operating 802.11ac routers, without any problems manifesting. The same unit is in a more densely settled residential environment now, and is having connectivity issues from an unknown source. A second LG UltraFine 5K unit tested on Monday also fails to show signs of the Wi-Fi router issue, nor does it display problems with any other possible source of strong RF interference. Earlier this week, a NetGear NightHawk X6 router was held directly on top of the monitor with no ill effect, and on Thursday AppleInsider plugged in and ran a 1000W microwave less than a foot away from the front and back of the display, also with no problems induced. AppleInsider confirmed on Monday that both LG and Apple engineers are examining the situation. Possibly related, AppleInsider used three different Thunderbolt 3 cables in three different retail boxes, all purchased online, to connect the monitor to a host Mac. "At first analysis, it may be an issue with insufficient RFI shielding on a very limited quantity of the cabling bundled with the monitor," a source within Apple corporate told AppleInsider on Monday. "We're continuing to look into the rare trouble reports with the monitor." 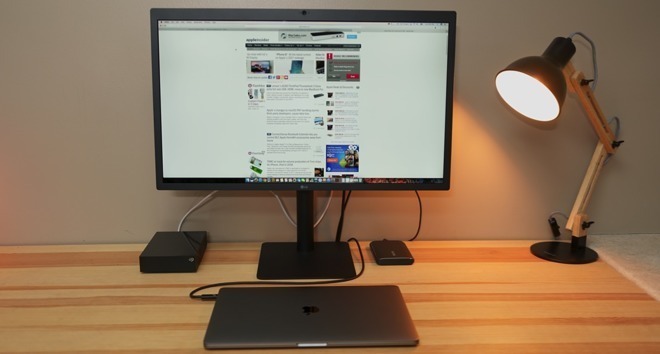 Sources working with AppleInsider have obtained 8 LG UltraFine 5K Displays and four LG UltraFine 4K Displays for testing. The 12 displays are being evaluated in an RF-controlled commercial test environment simulating a residence or office space. In the test environment, two of the UltraFine 5K monitors are exhibiting periodic connectivity issues that are unrelated to display resolution, make and model of laptop, or cabling manufacturer. None of the 4K USB 3.1 Type-C displays are having issues. More exhaustive testing including controlled RF across many frequencies will continue, and AppleInsider will report back with any findings. The sample size of tested monitors is not sufficient to make any claims about percentages of afflicted monitors, but may shed some light on how the problem can be minimized or ameliorated by users.